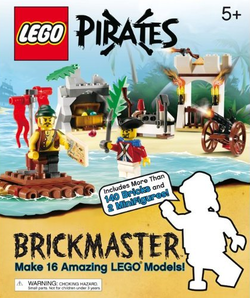 Brickmaster Pirates is a Pirates book released in 2009. It includes 140 pieces and 2 Minifigures. Treasure Island - Includes a raft, a cannon and a cave with chest of treasure. Pirate Beach - Includes a boat, a palm tree, a pier and some treasure. Island Harbour Fort - Includes a fort with catapult, a pirate raft and treasure. Pirate Prison - Includes a prison cell, a cart and treasure. Island Fort - Includes a catapult, a pier, a three level fort and treasure. Weapons Cart - Includes a pull along cart with a place for treasure chest, a secret hideout and a catapult. A building instructions page from the book. Another page of building instructions. This page was last edited on 9 January 2016, at 23:25.